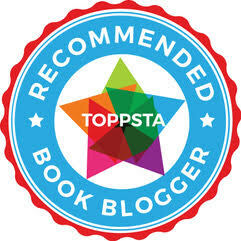 Occasionally we get asked to review a book or be part of a blog tour and I'm always wary about doing so in case we don't love the book. Because fundamentally that's our guarantee - we only review books we love. But in this case I needn't have worried because BookBairn loves this book!! 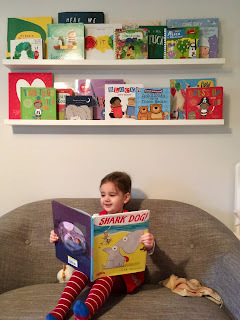 I popped it up on the Favourites Shelf to grab her attention and now we read it every day (sometimes twice or more!) 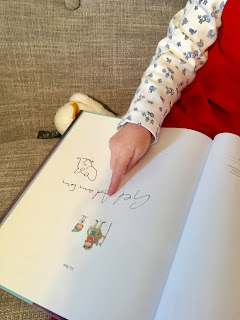 and she may have found the giveaway copy we have and insisted we read it too - sorry it's not quite pristine but it comes with the BookBairn stamp of approval! 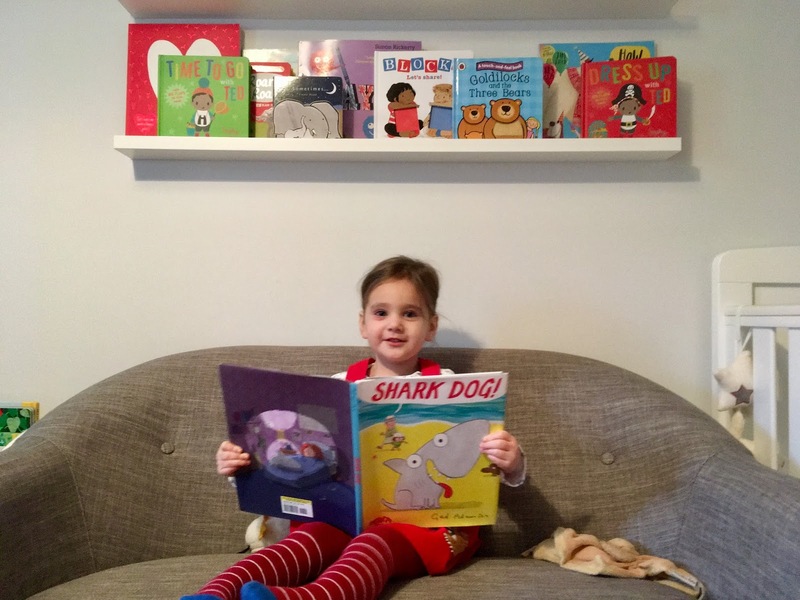 'Shark Dog' by Ged Adamson is a hilarious tale about a little girl who on an expedition with her dad discovers a curious but loveable creature. Part-shark part-dog, Sharkdog firmly thumps his way into their hearts. Sometimes when he's being a dog he's more like a shark and other times when he's being a shark he's more like a dog. But still he fits in, except at the beach: a fin sticking up out of the water sends everyone running. This is a delightful tale about what family means, about finding your place in the world, about what home really means! 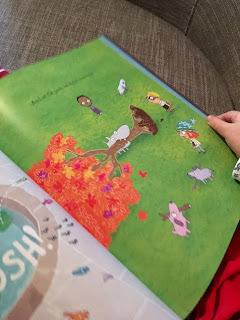 BookBairn's favourite part is, without a doubt, the illustration of Sharkdog playing with a stick, but he's got a whole tree in his mouth. She roars with laughter every time! Q: The book begins "my dad is no ordinary dad" - was this inspired by someone? A: Not anybody specific. I just imagined a dad who’s an old school explorer and very British! I wanted him to be kind and fun to be around. He takes his son with him on his adventures. How cool would that be for a kid! Q: Would you like to own a Shark Dog? Why or why not? A: I’d love to have a Shark Dog! He’s such a friendly and curious animal. He’d be the perfect guard dog and he wouldn’t really have to do anything. People would be wary of him at first but then they’d see how really he’s just a sweet, happy dog. Q: If you could create the perfect animal hybrid, what would it be? A: It would have to involve a dinosaur. I’d love to see a Tyrannosaurus Rex in real life. But my hybrid would be with a giraffe but you wouldn’t actually see the giraffe part (I know I’m cheating!). It would be the temperament and vegetarianism of a giraffe. So he’d be a harmless T-Rex that eats plants instead of people. 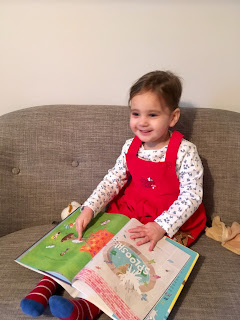 Q: In BookBairn’s room we have a ‘Favourites Shelf’ of her favourite stories, which picture books would you have on your Favourites Shelf at the moment? Pandamonium At Peek Zoo by Kevin Waldron - brilliant, funny book. A family favourite. Yeti And The Bird by Nadia Shireen - I love her humour so much. Oh No, George! by Chris Haughton - truly original illustrator and we all think George is so cute! Goodnight Already! by Jory John and Benji Davies - just hilarious especially when the duck looks through the window. This Book Just Ate My Dog! by Richard Byrne - a clever idea that uses the physical book as part of the story. I love the big, stupid, sweet dog. Last Stop On Market Street by Matt de la Peña - a wonderful, moving story beautifully told and illustrated. My Friend by Beatrice Alemagna - this is so lovely and encapsulates everything that makes her the genius that she is. Q: I’m sure there illustrators who have inspired you, can you tell us a few that you like the most? A: My big influences are people like Ronald Searle and Charles Schultz. Ronald Searle was just jaw droppingly talented. When I was a kid, I got to know his work through things like the St Trinians films and the Molesworth books. He’s so massively imitated. I was obsessed with Snoopy and Charlie Brown as a child. The other kids in school used to get me to draw them. I still have loads of Peanuts books. There are lots of contemporary illustrators whose work I love - like Beatrice Alemagna who I’ve already mentioned; Isabelle Arsenault; Kevin Waldron; Fabi Santiago; Laura Callaghan; Reza Ferazmand (Poorly Drawn Lines); Johnny Sampson; Lauren Humphrey. I could go on, there are so many! Q: If you could choose any book to create new illustrations for, which would you choose? A: Ooh that’s a good question! I’ve always loved Charles Dickens and to illustrate something by him would be like a dream job. A Christmas Carol for example. Emil And The Detectives by Erich Kästner would also be a good one. I’m fascinated by clothes so a story that was set in, say, the 1960s or the Edwardian era would be a real pleasure to illustrate. All those great styles! Q: "Our Aquarium has dogsharks - is this like a sharkdog?" A: Wow you’re so lucky to have an aquarium with dog sharks! They are similar to shark dogs but shark dogs are sort of rounder and they’ve got legs. I’m not sure who would win in a swimming race. A: Orange is a very nice colour but I think mine must be green because I’ve got so many clothes that are green. There are colours that, when they’re together, I really like the combination. Like pink and brown. Or pink and orange. Or green and grey. A: My favourite animal has to be a dog. They’re so friendly and lovable! A: I’ve just drawn lots of dinosaurs for a new story idea. I always draw a leg and a foot with a fancy shoe. I don’t know why. It’s just what I always doodle. Thank you Ged for joining us and answering our questions! The wonderful news is that Ged sent us an additional signed copy for a giveaway! 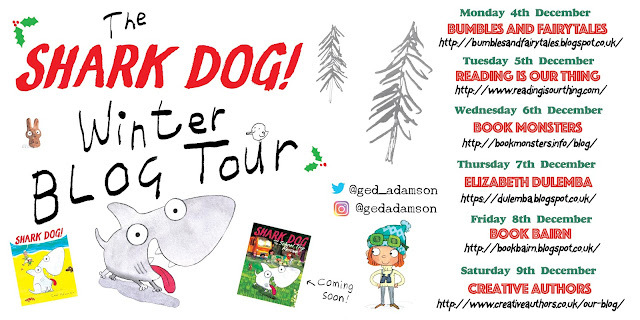 To read the other blog posts in the tour, check out the banner below to find out when and where to be (and I'll also be sharing on our Twitter). I read Shark Dog with BookBairn the other day and she loves it. My animal hybrid would be with a lion and a penguin because they are BookBairn’s favourites. I’d love to hear a penguin roar. It could be called a penguion. And she was dressed as a penguin whilst clutching Louis lion when you arrived today!